The last piece of the puzzle is finally here. To round up my PC upgrade is the graphics card. If you’ve read my previous update, the only major changes I’ve made are to the CPU and motherboard. I did get new peripherals and slapped on a SSD as well as an additional sound card. The reason I gave for not upgrading the GPU is due to the fact that I wasn’t playing any games that required a more powerful card. Besides, most games these days don’t even need that much power anyways. I couldn’t find any deals that would entice me enough to part ways with my money. That said, with the surprisingly discovery of eBay’s Global shipping program, I finally yielded. Yes it is weird how that could actually be the catalyst to me actually deciding to go for the upgrade. 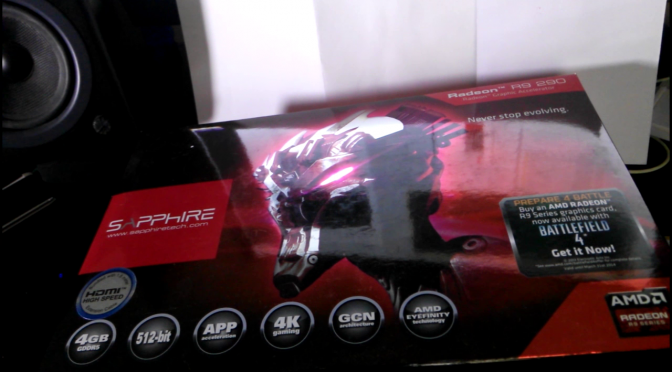 Anyways, I bought a second hand reference R9 290. I really wanted to stick with nVidia but the cost to performance ratio favoured the AMD cards way too much for me not to jump ship. Why nVidia? No particular reason. Been using their cards for quite some time and didn’t find a need to change. I knew, beforehand, that the R9 290 reference card was not only loud but hot as well. I thought what I had was pretty loud (a Palit GTX 580) but boy was I in for a huge surprise. The card started out quiet but wait till you crank that fan speed up. It defaults at 20% and it remains silent. The problem though was that the idle temperatures were too hot for my liking. Turning up the fan speed to 40% and boy was I in for a ride. An airplane taking off? I sure can hear that starting to come together. Thankfully my PC isn’t placed on my desk or right beside me. It is slightly further down below under the table. That said, it is way too loud. I certainly can’t take the sound. So what now? I guess it is time for an upgrade for the upgraded graphics card.